That it is raining, is not a complaint. It can also be helpful when you have to do work – because you are not longing to be outside. Sunday was not a day of rest for us, except for the sleeping in part. Then it was off to work, for almost a full day. Today was also a work day. Our office was at about 50%. If we work, we can save the day for a future day off – during the calendar year. I do plan to take advantage of that – in the future. For right now there are just too many irons in the work fire. And at our Board meeting tomorrow I get to get a piece of paper telling me I have worked there for 25 years. I wish I had thought enough to find a picture from my first year, and the one from now. But we did not have badges back then, and especially not badges that open doors. I do know that when I started we were just getting to 5000 water customers. Now we have well over 16,000. Even more telling – when I started I could drive without stopping (after I had turned out of my neighborhood) until I reached work. Every intersection I went through had a “free” right turn (Yield). 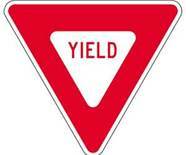 Quick – what color is a Yield sign? Now, I think it would be about 10 traffic signals. That assumes I take SR 520, which is now a toll road. So more frequently I take I-90, which results in 5 additional miles and about 11 traffic signals. This is the only job my kids have ever known me to hold. I was laid off from my previous job while on maternity leave with Rey. He was 5 months old when I managed to land this gig. I needed the work, or I might not have taken a job 25 miles away. All in all, it was a good decision. – And a yield sign is not Yellow. It is Red with a white interior. This is actually an age thing. It used to be yellow. This entry was posted on November 12, 2012 at 8:37 pm and is filed under Uncategorized. You can follow any responses to this entry through the RSS 2.0 feed. You can skip to the end and leave a response. Pinging is currently not allowed. Also, I got Carl’s post card today — very tender, and yet amusing to me since a) I really don’t care much for the muppets and b) The Rainbow Connection song is on my ‘dis-like’ list.